An interview synopsis of money manager titan Stan Druckenmiller with Kiril Sokoloff chairman & founder of 13D Global Strategy & Research, from Real Vision. Stan was the Founder, CEO, President and Chairman of Duquesne Capital Management until 2010. He was a Managing Director at Soros Fund Management from 1988 to 2000. Stan was employed at The Dreyfus Corporation, where he developed and ran the best performing mutual fund in the industry from its date of inception to his departure. His unrivaled track record spans many decades, making Stan one of the world’s most successful money managers. Stan viewed the economic world as a challenging puzzle at the beginning of 2018. Interest rates were too low worldwide. There were negative real rates, yet central banks were expanding their balance sheets by $1 trillion per year. The US is now letting $50 billion per month run off from their balance sheet. Europe has been doing QE of $30 billion euros per month and Stan believes that will go to zero by the end of 2018. If you go from a trillion in central bank buying a year down to zero does it matter if global interest rates are too low? All of the rhythm has come out of the market and price signals have become confusing. In Feb. 2018 we saw some concentrated selling by the algos, and also in China in 2015. That was scary. The machines are programmed to sell if the market is down 2%. This suppresses a trend just as it’s taking off. The machines are running and they can’t be stopped. A huge amount of money is being managed by computers. If you don’t raise rates then asset prices continue to build, and deflating an asset bubble will cause a deflation. Raising interest rates back to normal is more challenging now than it was five years ago. But it’s the chicken and the egg. When you can borrow money at 0% interest of course debt is going to explode. If we normalize, we’re going to have a problem because of the huge debt. Stan would raise rates every Fed meeting, as long as he could. Then the minute there was a financial disruption he would back off. The sad thing is that since he first made that statement five years ago we’ve had rip roaring markets. Now he’d say to just sneak one in every time you can. The Fed has passed up on so many golden opportunities. The problem now is that the debt is so much higher, particularly in emerging markets. You’re not going to be able to raise much more, and we’re already starting to see the consequences. The more egregious QE is in the ECB and one can only imagine the rot that must be in those banks from malinvestment. Money is flowing into the US from emerging markets. If the tightening continues then the bombs will keep going off in the emerging markets. They were the biggest recipients of free money because: A) All the money managers poured money in and B) There are no market constraints on the political actors. Things like Argentina issuing 100-year debt at 7%. Stan’s never seen a government last 5 – 10 years, never mind one hundred. Focus on capital preservation. and carry a big bat for a big bet. If you’re going to make a bet like that it has to be in a very liquid market. Stan makes more of those bets in the bond and currency markets because they are liquid and he can change his mind. If you’re betting a large amount on an equity you just have to be right because at that size it’s not liquid. Between 1998 – 2008 Warren Buffett’s company was down 40%. A hedge fund couldn’t lose money like that for more than 3 or 4 years or they’d be out of business. He likes to get in early and not pile on after a very early stage. When he’s down then he takes a lot of little bets until he breaks even. He says that at the end of the year you take a percentage of whatever profit you made for the year. Then psychologically and financially you reset to zero. Last year’s profits are yesterday’s news. Life goes in streaks. Like in baseball, sometimes you’re seeing the ball and sometimes you’re not. When you’re managing money you must know if you’re cold or hot. When you’re cold you should be trying for bunts and not swinging for the fences until you get back in a rhythm. He believed that if he was down then he hadn’t earned the right to play big. The little bets were on to simply tell him if he was starting to make hits again. This view dominates his thinking, but if a once-in-a-lifetime comes along you can’t sit there and think you need to earn the right to make a big bet. His biggest win was after he took a four month sabbatical and could see the overview picture. He was seeing things fresh and wasn’t hitting badly yet. It’s a huge function of success or failure. Know when you’re hot or cold. US equities have gone up for almost ten straight years. Everything for Stan has been about liquidity and not earnings or politics. One of these Fed hikes, he doesn’t know which one, but one of these hikes is going to trigger this thing. He’s on triple red alert. We’re not only in the timeframe of a decline, we’re also in the part of the curve when it starts. Maybe markets don’t anticipate the way they used to. There’s no more ECB money spilling over into the US equity market at the end of the year. If we get a blow-off in the fourth quarter, which happens seasonally in NASDAQ top markets, particularly if the financial bombs keep going off in emerging markets, then he’ll probably be ready to go short the market. The JGB (Japanese Government Bonds) used to be looked at as the outlier but really it was the leader. Japan is part of the puzzle of world economics. Japan looks to be ending QE by the end of the year, at the same time as it looks like the ECB will stop buying bonds. And at the same time it looks like the US will be shrinking their balance sheet $50 billion per month. All these pieces fit together for a reckoning. Japan finally understands that it’s killing their banks, which is the blood and the oxygen you need to run the economic body. That’s causing a political problem. They are finally starting to normalize and it’s important, but only as a piece in an overall puzzle. It’s going to be the shrinkage in liquidity that triggers this thing. It’s already triggered in emerging markets. That’s kind of where it always starts. Where Stan hasn’t seen it yet, and he believes we’ll see it before we see the equities go down, is the credit market. Probably since the 1890s this is the most disruptive economic period in history. There’s hardly any bankruptcies. There’s probably so many zombie companies swimming naked with the tide. There’s going to be some level of liquidity that triggers it. It’s nuts. Corporations are buying back their stock and there was trillions spent without a cash return, running down their balance sheets. What happens when interest rates start to reflect credit risk? You can make a case that we’re going to have a financial crisis bigger than the last one because all they did is triple down on what caused it. And they’ve tripled down on it globally. They’ve tried to solve the problem of debt with more debt. That was tried in the 1920s and that didn’t work out. There are zombie companies out there. Will they infect the banking system again next time? There $100 trillion in unfunded US liabilities – Medicare, Medicaid, and Social Security – it’s 5 times GDP. It’s just as bad in the rest of the world. There’s going to be some tough times. Envy is one of the strongest human emotions. Populism comes when there’s a great divide in income disparity. The previous populist periods were set off by worse economic stats than we have now. The wealth disparity today was accelerated by QE and the internet has broadcast it across the globe. Stan believes Amazon’s Jeff Bezos has earned everything he has, but how can a normal citizen contemplate Bezo’s estimated wealth of over $150 billion? That’s the seed of the populism we’re seeing around the world. This is going to get worse. It can’t stop. It’s built into the system. You end up with some major dislocations economically and politically because of it. It’s not about Trump. It’s global and it’s happening everywhere. Macron won in France probably as a short term response to Trump as a populist, but apart from that there’s just been surprise after surprise to the elites on these elections. There could be a financial crisis bigger than the last one because they tripled down on the thing that caused it – debt. Too much bad investment. Stan doesn’t know who the boogie man will be this time but he knows there’s zombies out there. There’s a populist sentiment in the debtor versus creditor world of vast economic disparity, and it’s being shown every day across the internet. When there’s no more liquidity will the zombies, the companies that need bailouts in order to survive, infest the banking system like they did last time? It’s going to be the shrinkage in liquidity, one of these Fed hikes, that triggers this thing. Stan is on triple red alert. 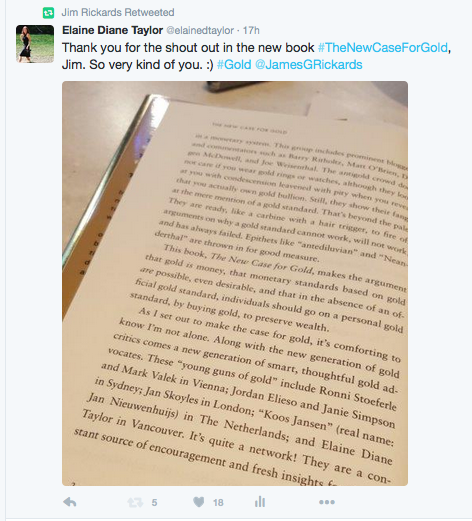 A big thank you to Jim Rickards for including me in his New York Times bestselling book The New Case for Gold.